Did you spend hours in the back of your parents’ car singing the song, Dead Skunk In The Middle Of The Road? We all sing at least one bar, or at least think it every time we get a good whiff…are we right? 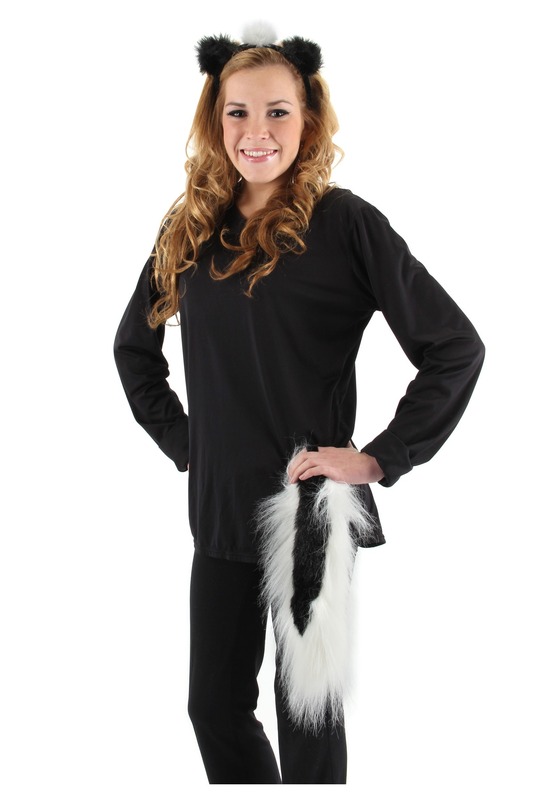 If you still love skunks despite their malodorous “tendencies,” you’ll adore this quick and easy costume that is sure to incite some laughter…or at least part the crowd. We bet you have a black shirt and pants hanging in your closet now, or a leotard, or onesie...your secret is safe with us, by the way. The point is, we know you’ll look put together without the hard work, and no one will tell you that your costume stinks. This black and white look is the easiest skunk transformation out there with fuzzy ears and a fuzzy tail. The black ears are attached to a soft fabric-lined black headband and have a fluff of white to let everyone know you aren't just a run-of-the-mill bear. The tail attaches to pants or a dress by pin or hook and loop fastener. So, go ahead make a stink at your next costumed event! But just be forewarned, if something smells a bit “off” at the party, you might be the one to take the blame. At the very least, no one will forget your adorable costume.